The content of the part-time Master's in International Relations is basically the same as that of the full-time programme, but the syllabus is carried out at a different rate, since the programme lasts for two academic years (four semesters). The flexible part-time master’s enables students to combine their studies with other activities. Students have the possibility to participate in an academic exchange programme or to do an internship in their second year of study. 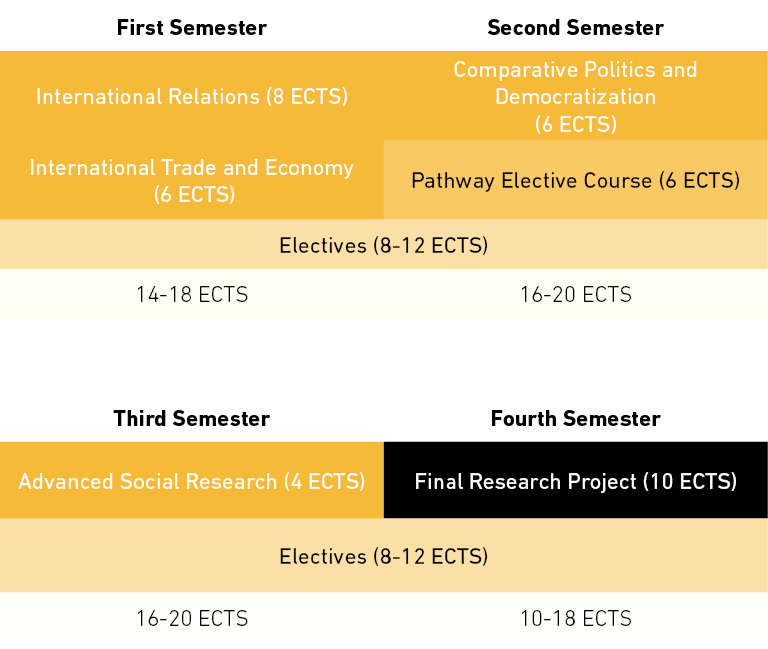 The part-time Master's in International Relations is structured into three semesters of compulsory courses and electives (studying a total of 50 ECTS credits), taught by highly-qualified academics linked to the three universities that jointly offer the degree, as well as to other prestigious international institutions, and a fourth semester dedicated to carrying out the Final Research Project (10 ECTS credits). Pathway elective courses: 6 ECTS (At least three pathway core courses will be offered during the afternoon schedule). Electives: 20 ECTS. A minimum of 40 ECTS in electives will be offered in the afternoon schedule, throughout the two years of the programme. Classes take place in the afternoon from 4pm to 9pm (September to June). At least three of the pathway elective courses will be offered in the afternoon schedule. Part-time students can also choose electives taught in time slots other than those offered during the afternoon period.